A three-wire socket on the Table Lamp lights the top, bottom, or both top and bottom at the same time. Lamp base measures 12-3/4"H x 7-1/4" square. The Magazine Rack provides storage for magazines and newspapers below the tabletop. Measures 17"W x 13"D x 24"H. All plans drawn FULL SIZE. 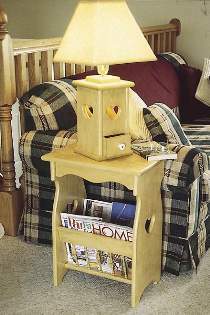 The #1045 Magazine Rack/Table Lamp Special includes #W2054 Table Lamp Plan, #W2064 Magazine Rack Plan, #1248 Three-Wire Lamp Parts Package, one #1662 Ceramic Knob and ten each #S6 Furniture Spindles. The #W2075 Magazine Rack and Table Lamp Plan Special includes plans for #W2054 Table Lamp and #W2064 Magazine Rack.